Probably one way to make sense of activity of interest twitter is explore some numbers and visualization of them. The last one is the amazing-est! In a busy network like Ontario Extend, it eventually assumes the same of the Star Wars Death Star- an inner core of highly connected persons and a periphery of people who fly by briefly. 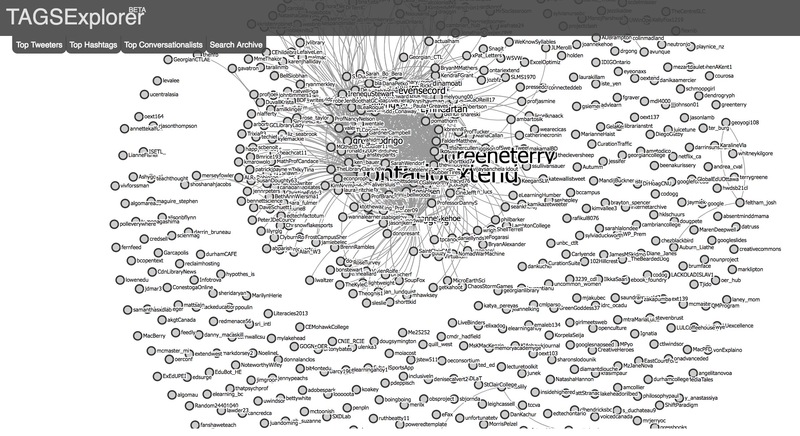 Lines represent connections by mention or retweet, and the size of the label is proportional to the person’s activity. When I use this in my class, I have my students use links like this to reflect on their own activity, and how it changes over time, in the network. How do you find your link? When you visit the Conversation Explorer, it’s a matter of appending the URL with &name=YOURTWITTERNAME so for me I first go to the Big HairBall of Tweets, add to the end of the URL &name=cogdog, sit back, and enjoy. Or analyze. 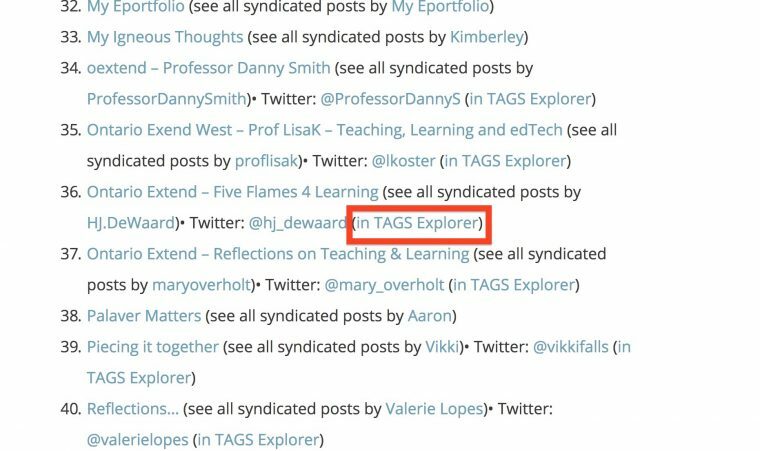 We make it easier for people who have added their blogs to the Ontario Extend Domain of One’s own Hub/ Just find your listing in the list of all blogs (or say the listing for one cohort), and click the link for in TAGS Explorer. It’s quite easy to create a Twitter TAGs worksheet, and you can do it for more than just hashtags, it works with any kind of search you can come up in the Twitter interface. 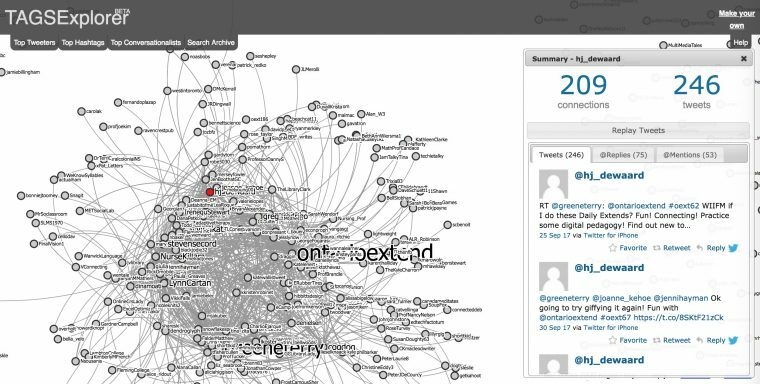 I created a new Ontario Extend activity Archive, Analyze and Visualize Tweets with Your Own Twitter TAGS Worksheet that can hopefully get you started. To me, it’s Curator Module material. Please give it a spin and share any ideas you have on what you might be able to do by extending with your own Twitter archiving and curation and analysis tool, all for the price of a free Google Spreadsheet. Developer of Twitter TAGs Martin Hawksey has shared an illustrated and well-explained guide to setting up Twitter Tags (Google Doc). I’ve been using this for many years to great effect, and find it invaluable. But have you ever worked out a way to create an archive retrospectively?